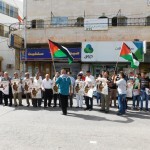 “Ramadan Tov” read the posters, held by supporters of the Palestinian internal boycott, about forty of whom had gathered for a demonstration in the West Bank town of Salfit. The poster featured a picture of an Israeli soldier, in full combat gear, holding out a tray filled with household goods: Ein Gedi bottled water, Tnuva yogurt, Tapuzina juice. The use of the word “Tov”, Hebrew for “happy”, underscored the meaning of the posters: if you buy food for Ramadan from Israeli companies, the profits would go back into Israeli society, and tax coffers, and eventually benefit the occupying army.